I suspect you've been pacing back and forth, refreshing your computer again and again, twiddling your paws. The wait is over! Dim the lights, turn UP the volume and hit PLAY. Then REPLAY. Then REPLAY again. You've got it. But first, we want to welcome two new players to this episode's cast - Cat Chat's Cody and Spitty from Spitty Speaks! Former crew members Cody (Pub-lick Relations) and Spitty (Royalties Negotiation) are making a splash ::literally:: in the latest episode. 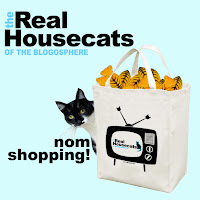 Watch Real Housecats Of The Blogosphere - Episode 2 on our YouTube channel or just click below. 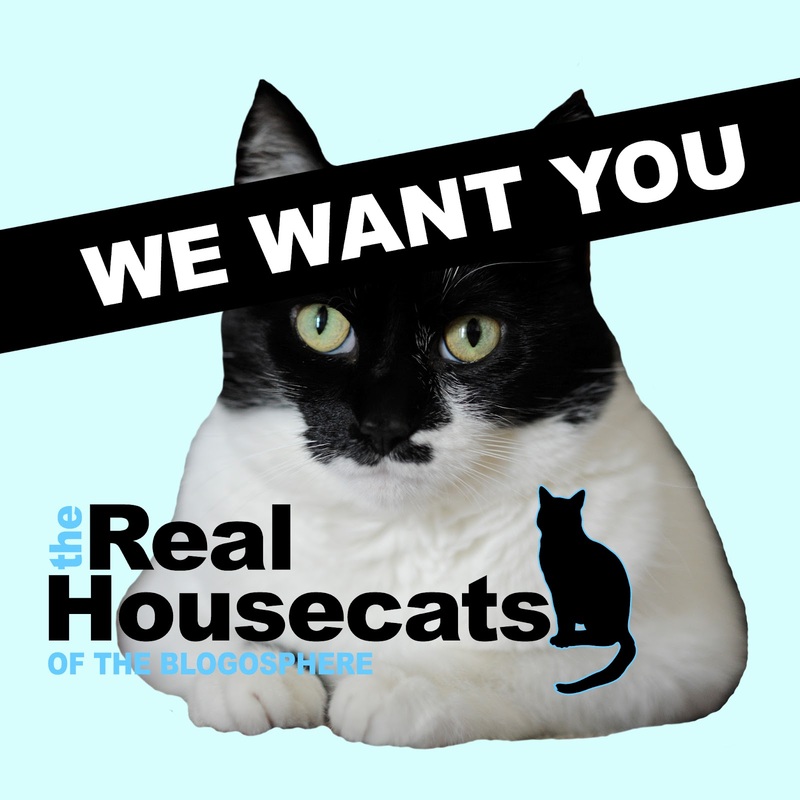 We're taking submissions for the next cast of Real Housecats. Deadline is April 1, no fooling. Click HERE for how to apply. Get those peeps of yours in gear. Did you know that we just opened The Official Real Housecats Store? Whether you're a cast member or not, you've got to check out all the cool designs! Please, no pressure intended...we don't expect that everyone will want or be able to part with their green papers and that's okey-dokey. We just wanted to have some fun. It's Gloman's birthday this week, so I've got shopping to do! Just click on SHOP at the top of the page or click HERE to teleport over to our snappy new Zazzle store. A big ME-OW to this episode's Housecats! Click on their names to visit them. Can’t believe it. I am laughing so hard and I’m just off too bed!!! So BRILLIANT. It’s going to need plenty of views to get every nuance lol. Excellent! We just had Mom share it on her FB page!!! We love it!! I think is might just be a while before we quit smiling at that one! Bravo!!!!!! Figaro is blushing...and we are all loving every minute of it! Oh that was just fantastic! Loved it, especially CK as the DJ and the mosh pit and the gossip girls...well all of it really! Great job! Whoa! You make me look so good! Wait, I always look so good! Loved it. DJ CK doing her thang. The gossip bit was precious! HAH! It's not a letdown as some 2nd episodes are. Well done! My hat's off once again. Yous gots more to spill? Me loved every minute of being the star! Me is going to share on FB, but first me had to send it to all my email friends! And me has Pinned it! BTW, me has gived yous the Very Inspiring Blog Award, because Katie and Glogirly, yous inspires ME!!! Stop by my bog and picks it up! ::clap clap clap:: We LOVED it!! We loved the party scene...Wally in the mosh pit!! Milk on everybuddy's head!! Austin and the nip!! MOL!! Katie, you and Glogirly have outdone yourselves this time!! We all LOVED it! We are very proud of our Figaro and Ginger and all of our CB furriends who pawticipated. Such talented kitties! Katie, you and Glogirly deserve the Acatamy Award for Direction and Producing! Wow, that was just amazing! Your show should be on prime time. "just wants in his private tunnel"??? MOL MOL MOL MOL MOL MOL MOL MOL MOL!!! This is priceless! We luf it. Great job! Clapy Clap clap... pawdy paw paw! Dats was sooo goods and funny! what purrgram you use to makes your Glogirly TV Series wifs?? We can't believe it! Meowsh Pits & Tail Extensions! This may be too much for kittens and young kittehs. Some of you have asked what program we use to make Real Housecats. We use iMovie on our Mac for all the videos and movies. But we also use Photoshop to prepare all the individual slides that go into it. This was so funny! Loved all the splashing milk. MOL! That was great! it gets better and better. We loved the gossip, and Kite in the feathers looked so exotic! heh heh. We know where Kite got her fevvers! We are sorry to hear you lost your Mom to cancer - it is a terrible disease. That is such a great video. Well done. It is so cute. Take care. MOL MOL MOL this is hilarious. Well done!! I'm going to have to ask my assistant to hop to it to submit some pictures for me. Glogirly is taking crazy cat lady to a whole new and exciting level. Thank you for visiting and commenting on my blog today. We love the idea of tail extensions and Kite looks fantastic in her headdress. ::gasp:: That Arty Mouse! No wonder her tail is so full and shapely. I should have guessed! That was so funny! Oh Austin, get outta the nip! So many great things to look at!! Thanks again for sending us my special milky picture! Look for it soon in a blog near you, MOL! HAHAHAHAHAHA!!! Rumblemum can't stop laughing, she really liked the crowd surfing Wally!! PeeS: Will have the plug post up on PFT a little later this week ;) Will give you a bark (sorry, my lips are incapable of meows ;) when it's up. Just wonderful!! 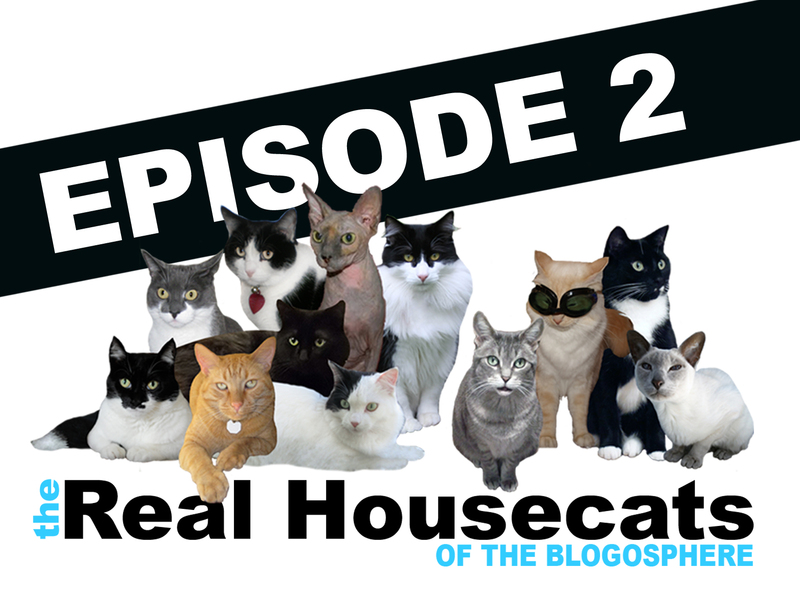 I am officially a Real Housecats junkie and can't wait for the next episode! MOL, we love it! The paws waving, the nip and the milk Moet are purrfect. And isn't Nellie the perfect gossip hostess? We can't wait for the third! Way to go, everyone!! Wowza! We enjoyed it, the pawty, the moshpit, all ze pawzzzz!! I love it. Everything is so well done and hilarious. I doubt if I could take good enough pictures of Herman to get him to participate, but I just might try. Shout-out, GG & Katie! Hugs, Bugs. Bugsy, you forgot the link.